The following code loads the signal and produces a time series plot. Windowing premultiplies input data supplied to the FFT with a value that smoothly decreases to zero at each end of data. The purpose is to reduce "leakage" aberrations in the FFT output that are introduced by sudden changes in the data at the start and end of data. Windowing reduces DFT leakage by minimizing the magnitude of the sinc function’s sin(x) / x sidelobes. This is accomplished by forcing the amplitude of the input time sequence at both the beginning and the end of the sample interval to go smoothly toward a single common amplitude value. 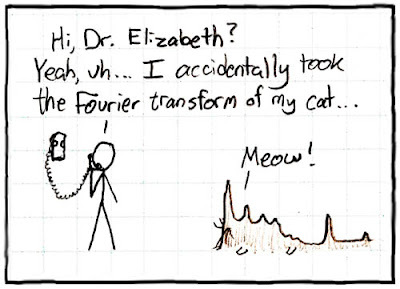 (taken from Understanding Digital Signal Processing – Lyons). In this example we will compare the sidelobes created by the rectangle window as compared to the blackman window. Looping is helpful if we need to repeat certain specific commands. In this example we will use the for loop to create a sinusoid of various frequencies as a function of the loop variable. The following code creates six (6) plots, each with a different 'frequency' as determined by the conditional if statement based on our loop variable i. The following function creates a lowpass elliptic filter. By implementing this filter in a function we can easily call the lowpass filter in our code, passing our signal "x", sample frequency "fs", and desired cutoff frequency "fc". The following example show noise averaging affects for a WCDMA signal. Coherent averages were taken of a WCDMA signal with additive noise k=.1. The first plot shows a pure WCDMA modulated signal with additive noise. The plot below shows a zoomed in area of the shoulder. In this tutorial we will use an audio signal as a practical example of common DSP techniques. We will apply the concepts of sampling, time-domain analysis, spectral analysis, and digital filtering. We will load an external sound file in wav format into Matlab for this analysis. Basic Matlab plots will be used to display our results. The Spectrogram will also be introduced. Before we start, let’s review audio frequencies. Taken from Wikipedia: “An audio frequency is characterized as a periodic vibration whose frequency is audible to the average human. While the range of frequencies that any individual can hear is largely related to environmental factors, the generally accepted standard range of audible frequencies is 20 to 20,000 hertz. Frequencies below 20 Hz can usually be felt rather than heard, assuming the amplitude of the vibration is high enough. Frequencies above 20,000 Hz can sometimes be sensed by young people, but high frequencies are the first to be affected by hearing loss due to age and/or prolonged exposure to very loud noises. We will use the Wikipedia definition as a guide to help us filter the audio signal. To load the wav file (Pule Code Modulated file) we use the wavread function in Matlab. We need to know the sample frequency that was used to produce the file to play it at the correct speed. The following code will open the file and play it using the soundsc function. The following code will plot the audio file in the time domain. The following code will plot the audio file in the frequency domain. This section uses the ComputeSpectrum function we created in a previous blog post. Notice the spectral content, most of the content is below 500Hz. This is good, this is what we expect from an audio signal. The following code implements a tenth order (ten pole) low pass Butterworth filter with a cutoff frequency of 3400Hz. Cutoff frequencies are specified between 0.0 and 1.0 where 1 corresponds to half the sampling frequency: fs / 2 (4000 in our example). For example, for a cutoff frequency of 3400Hz, we specify this as 3400/(fs/2). The figure below shows the frequency spectrum of the filtered signal; notice how all frequencies above 3400Hz are basically gone now. Matlab provides the calculated coefficients if needed for later use or reporting. These are contains in the variables [a,b]. * 'low' : Low-pass filters, which remove frequencies greater than some specified value. * 'high' : High-pass filters, which remove frequencies lower than some specified value. * 'stop' : Stop-band filters, which remove frequencies in a given range of values. To implement a ‘high’ pass filter, simply specify the cut off frequency as we did above, and use the ‘high’ keyword in the function call. To implement the ‘stop’ band, a range must be defined. The following code will define this band. This code basically ‘chops’ out all frequencies from 750Hz to 950Hz. The spectrogram plot allows use to not only see which frequencies are present in our signal, but also when. Basic spectral analysis using the FFT does not allow us to see what spectral content is present at a given time. The spectrogram is a useful tool in spectral analysis. To display the spectrogram, the following code is provided. The 512 below is the number of samples that are used for the DFT, this becomes a grouping factor per column. Think of this as the granularity of the analysis, 512 is typically adequate for analysis. The spectrogram presents interpolated colors of magnitude vs. time. In the plot below, red for example means there is more frequency content at that frequency than say the light blue at a given time. Our audio file contains noise and voice harmonics therefore many frequencies are seen at any given time, however the magnitude of the voice range below 500Hz is see as the darkest (darkest red / black). 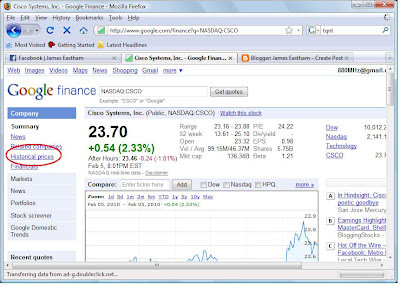 Raw stock data can be obtained by using Google Finance. Search for the stock of interest, and use the "Historical Prices" link on the left. You will see an option to download the data to a spreadsheet. Once you have the spreadsheet downloaded, you can delete the unnecessary columns (only need to keep the close price) and save the file as text for use with Matlab.